Make feta and herb dip; Combine feta, garlic, 2 tablespoons lemon juice and oil in a food processor. Process until smooth. Remove to a bowl. Season with salt and pepper. Stir in dill and mint. Cover and refrigerate until ready to serve. 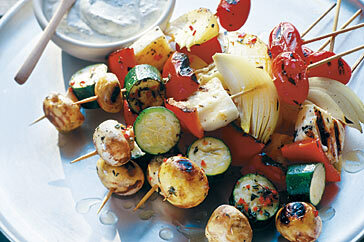 Thread tomatoes, onion, haloumi, capsicum, zucchini and mushrooms alternately onto skewers. Place kebabs, in a single layer, on a large plate. Whisk 1/4 cup lemon juice, oil, thyme, chilli and salt and pepper in a small bowl. Brush kebabs with marinade. Cover and refrigerate for 30 minutes. Spray a cold barbecue plate with oil. Preheat on high heat. Reduce heat to medium-high. Cook kebabs for 3 to 4 minutes, turning often, or until vegetables are tender and cheese starts to melt. Serve kebabs warm with feta and herb dip. You will need 12 pre-soaked skewers.